Draft: 2007, Chicago Cubs, 5th rd. Married Lindsay … has two children: Riley and Camden ... Twitter: @BrandonGuyer … Instagram: @bguyer5 ... Played three seasons for the University of Virginia … Ryan Zimmerman was a teammate as a freshman … hit .370 as a junior … majored in sociology ... Is a 2004 graduate of Herndon (Va.) High School … was a three-time letterman in both baseball and football … was a second-team all-state pick as a running back and linebacker during his senior year … scored seven touchdowns in one game on homecoming night his senior year ... His father, Ray, was a semi-pro tennis player. Spent his second full season with Cleveland, making 39 starts in right field, two in center and six in left ... Recorded an .804 OPS vs. left-handers, compared to a .513 mark vs. righties … went 4-19 (.211) as a pinch-hitter ... Was on the disabled list from 5/20-6/13 with a cervical strain suffered on 5/19 at Houston while attempting to field a foul ball near the stands … his rehab assignment included stints at Class AAA Columbus and Class AA Akron ... Hit his first career grand slam on 5/15 at Detroit (off Francisco Liriano) … tossed a perfect ninth inning on 6/16 vs. Minnesota, his first professional pitching appearance ... Batted a monthly best .357 (10-28) in July … connected on his third career pinch-hit home run on 7/27 at Detroit ... Batted .275 (11-40) with three doubles, one home run and five RBI over 19 games in September. Spent his first full season with Cleveland, missing six weeks with a left wrist sprain that hampered the first part of his campaign, finishing on a solid note before being shut down again with more wrist soreness on Sept. 14...Was on the 10-day disabled list from May 13-June 25, wrist bothered during the early part of the season and then tweaked the same wrist in pinch-hit appearance on Sept. 14 and did not play again the rest of the campaign (missed last 15 games). Over his first 21 games prior to the transaction he batted .182 (10/55) with 3 2B, HR, 5 RBI (.528 OPS)...Was activated on June 26 after a rehab stint in AAA Columbus and spent the remainder of the season on the active roster, batting .264 (29/110) with 4 2B, 1 HR, 15 RBI and 19 runs scored over 49 games. On the season he made 27 starts in right field (37 games), 18 starts in left field (33 games) and was 0-for-9 as a pinch-hitter...From July 19 thru the end of the year he batted .287 (25/87) with 16 runs, 4 2B, 1 HR and 13 RBI to finish out the season (4HB, 11BB, .385OB pct)...Slowed by more wrist soreness over the last several weeks of the season...Did not play after Sept. 14....Recorded a .691 OPS vs. left-handed pitching and a .577 OPS vs. RHP...Has an OBP of .403 (278 PAs) versus LHP since the start of 2016 (MLB Avg: .325)...Batted .282 (22/78) with runners on base. Underwent surgery on his left wrist on Oct. 11 in Scottsdale, AZ to repair the extensor tendon in his wrist...Surgery was performed by Dr. Don Sheridan. Trading deadline acquisition provided an offensive, reliable offensive spark against left-handed pitching and provided solid defense in the outfield over the last two months of the season...Was acquired from the Tampa Bay Rays on August 1 for two Minor League players and spent the remainder of the season with Cleveland…Combined on the year he hit .266 (78-293) with 17 2B, 1 3B, 9 HR and 32 RBI in 101 games...On the year he batted .336 (41-122) off LHP with 9 2B, 6 HR and 17 RBI with an OPS of 1.021...His .336 average vs. left-handed pitching was 6th-highest in the American League while his .464 on-base pct. led the A.L... Is under club control until 2018...Spent the first four months of the season with Tampa Bay, hitting .241 (51-212) with 12 doubles, 1 triple, 7 HR and 18 RBI in 63 games...Appeared in 25 games in left field, 18 games in center field and 12 games in right field this season after making at least 15 starts at all three positions last season for TB...Was on the 15-day Disabled List (4th time, career) with a left hamstring strain and rehabbed at Class-A Charlotte, June 25-28...Lead Major League Baseball with 31 hit by pitches and has now led the league three straight seasons in the category... Most hit by pitches in Major League history for a batter with fewer than 400 plate appearances (see box above)...With Cleveland he made 20 starts (26 games) in left field and 5 starts (7 games) in right field...Enjoyed his second career 5 RBI game on August 12 vs. the LA Angels and scored a career-high 4 runs on August 26 at Texas...Recorded an on-base pct. of .438 with Cleveland...Combined on the year he batted .262 (27-103) with runners on base and hit .344 (11-32) with RISP-2outs... Hit .387 (12-31) in September with 2 2B, 1HR and 6 RBI in 17 games to end the season...Hit .348 (8-23) vs. RHP with Cleveland...Hit .286 (8-28) on 0-2 counts on the year (T5th in the American League)... Guyer became the first player ever to enter as a substitute and have two hits in a deciding game of the World Series (Game 7)...Signed a two-year contract on Jan. 18. Established career highs across the board as he enjoyed his first fully healthy season in the majors, playing in 128 games, 79 starts (39-LF, 17-CF, 20-RF, 3-DH)...started all 53 games against lefties, 52 of those at leadoff…His 24 HBP led the American League and were most by any AL player since ANA David Eckstein in 2002 (27)...ranked 2nd in the majors to CHC Anthony Rizzo (30) and had 9 more than any other AL player (CWS Jose Abreu and TEX Shin-Soo Choo)...shattered the club record previously held by Sean Rodriguez (18 in 2011), passing him on Sep 19 vs. BAL...became the first Ray to lead the AL in HBP…Nineteen of his 24 HBP came against left-handed pitchers, most by any major league player since splits are first available (1914)...PHI Chase Utley held the previous record of 16 in 2007...his last 13 HBP in a row (and 18 of his last 19) came against lefties…With only 385 PA, averaged 1 HBP every 16.04 PA, the highest mark in American League history (min. 20 HBP) and a mark topped by only one player in the modern era (since 1900)...in 1971, MTL Ron Hunt averaged 12.76 PA/HBP when he absorbed a modern-era-record 50 HBP in 638 PA...became the first player in 125 years with 24 HBP in 400 PA or less, since Chief Roseman (29 in 369 PA) in 1890 for the St. Louis Browns and Louisville Colonels…Hit .271/.387/.457 (51-for-188) vs. LHP, and .257/.318/.354 (37-for-144) vs. RHP...has a career .362 OBP vs. LHP, compared to .311 vs. RHP...seven of his 8 HR in 2015 (and 11 of 14 in his career) came against LHP...only homer vs. a righty was July 10 vs. HOU (Collin McHugh)…Led the team with 52 starts at leadoff, and the Rays went 29-23 in those games...his .379 OBP from the leadoff spot ranked 3rd in the AL (min. 150 PA), behind teammate John Jaso (.404) and CLE Jason Kipnis (.385)…Was one of three AL players to start at least 15 games at all three OF positions, along with HOU Colby Rasmus and KC Jarrod Dyson...his .994 fielding pct. ranked 4th among AL outfielders, behind NYY Jacoby Ellsbury (1.000), LAA Mike Trout (1.000) and TOR Kevin Pillar (.996)…According to Stats LLC, led all major league outfielders with a .960 zone rating, which measures a player's efficiency in fielding balls hit into his typical defensive zone...it was the 2nd-highest zone rating recorded by an outfielder since they began measuring it in 1987, behind CAL Devon White in 1989 (.961)…Became the first player in club history with multiple pinch-hit (2) and leadoff HR (3) in the same season...was the first Ray with 3 leadoff homers since Matt Joyce (3) in 2013…Two of his 3 leadoff homers came in back-to-back games at Fenway Park (Aug 2 off Wade Miley, Sep 21 off Eduardo Rodriguez), making him the third visiting player since data is available (1974) to hit 2 leadoff homers in a season at Fenway Park, joining NYY Chuck Knoblauch (1999) and MIL Paul Molitor (1983)…His first career pinch-hit homer came May 8 vs. TEX...his 9th-inning homer on Sep 20 vs. BAL (off Zach Britton) was the first pinch-hit, game-tying homer by a Ray since Dan Johnson's celebrated homer in "Game 162" (Sep 28, 2011 vs. NYY)...the Rays won on a walk-off single by Kevin Kiermaier later in the frame…His 43 PA as a pinch-hitter were the most in the AL in one season since TOR Tony Fernandez had 45 in 2001...his 10 pinch-hits tied the club record (Travis Lee in 2005) and were 2nd in the AL to CLE/LAA David Murphy (11)...his 9 RBI tied Murphy for the AL lead…Tied his career high with 2 SB twice: May 21 vs. OAK and June 27 vs. BOS...on both occasions, stole 2B and 3B in the 7th inning…Was hit by a pitch in a club-record 4 straight games Aug 4-8, the first AL player to do so since CWS Carlos Quentin (6, Aug 7-14, 2008)…Had 2 outfield assists on Sep 22 at BOS, the first two of his career…Tied a major league record when he drew 3 HBP in a game, Oct 2 vs. TOR, all by Mark Buehrle...was the first player with 3 HBP in a game since STL Matt Carpenter (June 4, 2013 vs. ARI, 14 innings), and the first in a 9-inning game since CLE Austin Kearns (July 5, 2010 at TEX)...was the second in Rays history to do so, joining Jonny Gomes (Aug 15, 2005 vs. NYY)...incidentally, the last time a player was plunked 3 times by the same pitcher was another Rays-Blue Jays game, on April 7, 2006 in Toronto (TOR Reed Johnson facing TB Casey Fossum). Made his first Opening Day roster and spent his first full season in the majors...appeared in 97 games, including 60 starts (51-LF, 5-CF, 4-DH)-42 against lefties, 18 vs. righties...missed 22 games due to a left thumb fracture...saw his first big league action in CF...Guyer and teammate Logan Forsythe were the only two players in the majors to start a game in all nine slots of the batting order...B.J. Upton in 2007 was the only other Ray to do this...according to the Elias Sports Bureau, they became the first teammates to do it since Pete Mackanin and John Castino for the 1980 Twins...Sustained a club-high 11 HBP, tied with CWS Jose Abreu for most among major league rookies and tied for 4th in the AL, in only 294 PA...Had 7 bunt singles, tied for 5th in the AL and 2nd on the team to Desmond Jennings (9)...Led the team (min. 50 AB) with a .323 (20-for-62) batting avg. with RISP...ranked 2nd on the club with a .297 (33-for-111) avg. against lefties, after Ben Zobrist (.340)...Among AL rookies with at least 250 AB, ranked 4th with a .266 batting avg. and 5th with a .334 OBP...was batting only .196/.212/.275 (10-for-51) through May 23, but after that hit .284/.362/.389 (59-for-208) through the end of the season, ranking 3rd among major league rookies during that span in OBP after CWS Jose Abreu (.413) and BOS Mookie Betts (.368)...Had 4 hits on May 24 vs. BOS, tying the Rays rookie record...was the first to do that since Desmond Jennings on Aug 28, 2011 at TOR...On May 25 vs. BOS, suffered a left thumb fracture while diving for a double hit by Grady Sizemore in shallow CF...was placed on the DL the next day...activated June 19...Set a Rays rookie record with 3 doubles on June 27 vs. BAL (G1)...on Aug 21 vs. DET against David Price, had his first career triple in the 1st, the Rays only hit of the game, scoring Ben Zobrist (reached on E6) in a 1-0 win...on Sep 21 vs. CWS, broke up John Danks' no-hit bid with a 1-out double in the 6th...His last 2 HR came off right-handed pitchers Miles Mikolas (Aug 13 at TEX) and Anthony Ranaudo (Aug 29 vs. BOS)...prior to that all 4 of his career HR had come vs. lefties...Selected as the 2014 Al Lopez Award winner for most outstanding Rays rookie during spring training...batted .302 (13-for-43) with 1 HR, 3 RBI, 3 2B and 5 runs in a team-high 22 games. Spent the season at Triple-A Durham and singled in his last at-bat of the season to get his average over the .300 mark…his .301 mark was 5th best in the International League and .001 ahead of Vince Belnome for the club lead…was the second time he has finished 5th in the IL in batting (also 2011)... Missed 27 games after he fractured his right middle finger when he was struck by a pitch from Gwinnett's Cody Martin on July 25…didn't return until Aug 23... Started at all three positions in the outfield (28-LF, 27-CF, 37-RF)... On April 9, became the first Durham player to hit 2 HR in an inning since the team joined Triple-A in 1998, pacing the Bulls to a 12-8 win over the Gwinnett Braves…the Bulls scored 10 runs in the 1st inning, with Guyer plating half of those runs on two blasts…also became the 12th IL player in 70 years to hit 2 HR in an inning, and the first since Kelly Shoppach of Pawtucket in 2005... Hit his first home run of the season on April 7 off Norfolk's Freddy Garcia, a 156-game winner in the big leagues... Has spent most of the last three seasons in Durham, batting a combined .305/.378/.487 with 24 HR, 115 RBI, 55 2B and 40 SB in 227 games. Missed the last four months of the season afterundergoing surgery to repair a torn labrum in his left shoulder on May 31...the surgery was performed by Dr. James Andrews in Birmingham, Ala...Recalled from Triple-A Durham on May 9 andplayed in three games (two starts, both in LF) before going on the DL on May 16...His lone hit was a home run in his last game, May 12 at BAL, a solo shot off LH Brian Matusz in a 5-3 loss...has hit two of his three career home runs at Camden Yards...all three of his homers have come against left-handed pitchers...Opened the season with Durham and played in 22 games, primarily in RF and CF...also appeared in LF and at DH...batted .294 (25-for-85) for Durham, including a .421 (16-for-38) mark over his last 10 games beginning April 18, raising his avg. from .191...On April 19 at Pawtucket (Red Sox) went 5-for-6 with three RBI and fell a double short of the cycle. Saw three stints in the majors, his first big league experience, and spent the remainder of the season in Triple-A Durham...his first two stints lasted one day each, May 6 at BAL and July 10 at NYY...was recalled on Sep 1 and remained with the Rays for the duration of the regular season...was not on the postseason roster...Started 12 games for the Rays (9-RF, 2-LF, 1-DH) including 10 of 24 after his September callup...9 of the 12 starts came against left-handed starters...Made his major league debut on May 6 at BAL before he was optioned to Durham the next day...in his first ML plate app hit a 2-run homer off Zach Britton joining pitcher Esteban Yan (June 4, 2000 at NYM) as the only Rays to homer in their first ML plate app...Became the first ever to homer in his first at-bat at Camden Yards...in fact, since the ballpark opened in 1992, no other player (visitors or Orioles) had ever homered there in his major league debut...was the 108th in major league history to homer in his first ML at-bat...Hit his second home run on Sep 7 vs. TEX off Derek Holland...Named to the International League midseason All-Star Team...batted .312 (121-for-388) in 107 games for Durham, finishing 5th in the IL batting race and 3rd among Rays minor leaguers...played all 3 outfield positions (55-RF, 36-CF, 17-LF)...Ranked 4th in the IL in OBP (.384), 5th in SLG (.521), 6th in OPS (.905) and tied teammate Russ Canzler for 2nd in the IL with 78 runs scored...Ranked by Baseball America as the No. 11 prospect in the Rays system entering 2012. Was named the Cubs Minor League Player ofthe Year after spending the entire season atDouble-A Tennessee ... hit .344 (127-for-369)with 13 HR and 30 SB...played all three outfieldpositions, seeing the most action in rightfield and left field. ... Has improved his batting average in each ofhis four seasons: .245 in 2007, .269 in 2008,.282 in 2009 and .344 in 2010. ... Led the Southern League in slugging pct. (.588) and ranked 2nd in batting avg., 3rd indoubles (39), 4th in extra-base hits (58) and 5thin OBP (.398). ... Following the season was named the No. 10prospect and Best Defensive Outfielder inthe Cubs organization by Baseball America,a Topps Double-A All-Star and a SouthernLeague All-Star. ... Was successful in 30 of 33 (91 percent) stolenbase attempts ... has a career rate of 83 percent(93 of 112). ... After the All-Star break led the SouthernLeague with a .424 avg. (72-for-170), 26 doublesand a .724 slugging pct. ... Posted a career-high 18-game hitting streak,July 26-Aug 18, batting .471 (33-for-70) with5 HR, 24 RBI, 9 doubles and 21 runs scored. In 2009 compiled a .282 avg. (128-for-454) with 62 R, 28 2B, 46 RBI and 30 SB in 130 games between Tennessee and Class-A Daytona...played mostly RF for Daytona and CF for Tennessee...Began the year with Tennessee and was sent down to Daytona on June 13...returned to the Smokies on Sep 1...in his first stint hit .173 (29-for-168) with 1 HR and 11 RBI...hit .333 (7-for- 21) in the second stint. Spent the entire 2008 season with Class-A Peoria...was limited to 88 games after missing the first month and a half due to a right elbow injury. Began his professional career in 2007 in the Arizona League...was shelved July 2-21 with a dislocated left shoulder...was promoted to Short-A Boise on Aug 17. March 27, 2019 Chicago White Sox signed free agent OF Brandon Guyer to a minor league contract. March 27, 2019 OF Brandon Guyer assigned to Charlotte Knights. March 22, 2019 Charlotte Knights released OF Brandon Guyer. 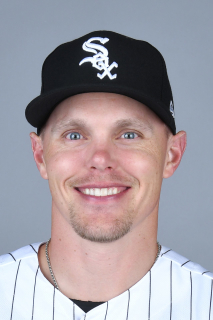 March 22, 2019 Chicago White Sox released OF Brandon Guyer. February 20, 2019 OF Brandon Guyer assigned to Charlotte Knights. February 12, 2019 Chicago White Sox signed free agent OF Brandon Guyer to a minor league contract and invited him to spring training. October 30, 2018 RF Brandon Guyer elected free agency. June 14, 2018 Cleveland Indians activated RF Brandon Guyer from the 10-day disabled list. May 29, 2018 Cleveland Indians sent RF Brandon Guyer on a rehab assignment to Columbus Clippers. May 25, 2018 Cleveland Indians sent RF Brandon Guyer on a rehab assignment to Akron RubberDucks. May 23, 2018 Cleveland Indians placed RF Brandon Guyer on the 10-day disabled list retroactive to May 20, 2018. Left cervical strain. October 12, 2017 Cleveland Indians activated RF Brandon Guyer. October 5, 2017 Cleveland Indians reassigned RF Brandon Guyer to the minor leagues. June 26, 2017 Cleveland Indians reassigned RF Brandon Guyer to the minor leagues. June 16, 2017 Cleveland Indians sent OF Brandon Guyer on a rehab assignment to Columbus Clippers. May 14, 2017 Cleveland Indians placed LF Brandon Guyer on the 10-day disabled list retroactive to May 13, 2017. Left wrist injury. August 2, 2016 Cleveland Indians activated LF Brandon Guyer. August 1, 2016 Tampa Bay Rays traded LF Brandon Guyer to Cleveland Indians for RHP Jhonleider Salinas and OF Nathan Lukes. June 29, 2016 Tampa Bay Rays activated LF Brandon Guyer from the 15-day disabled list. June 25, 2016 Tampa Bay Rays sent LF Brandon Guyer on a rehab assignment to Charlotte Stone Crabs. June 19, 2014 Tampa Bay Rays activated LF Brandon Guyer from the 15-day disabled list. June 14, 2014 Tampa Bay Rays sent LF Brandon Guyer on a rehab assignment to Durham Bulls. November 4, 2013 Tampa Bay Rays activated LF Brandon Guyer from the 60-day disabled list. September 17, 2013 Tampa Bay Rays transferred LF Brandon Guyer from the 15-day disabled list to the 60-day disabled list. Fractured right middle finger. August 25, 2013 Tampa Bay Rays sent LF Brandon Guyer on a rehab assignment to Durham Bulls. August 23, 2013 Tampa Bay Rays sent LF Brandon Guyer on a rehab assignment to Durham Bulls. August 2, 2013 Tampa Bay Rays recalled LF Brandon Guyer from Durham Bulls. July 26, 2013 Brandon Guyer roster status changed by Durham Bulls. March 16, 2013 Tampa Bay Rays optioned LF Brandon Guyer to Durham Bulls. November 1, 2012 Brandon Guyer roster status changed by Tampa Bay Rays. May 29, 2012 Tampa Bay Rays transferred RF Brandon Guyer from the 15-day disabled list to the 60-day disabled list. May 16, 2012 Tampa Bay Rays placed RF Brandon Guyer on the 15-day disabled list retroactive to May 13, 2012. Left shoulder strain. May 9, 2012 Tampa Bay Rays recalled Brandon Guyer from Durham Bulls. May 4, 2012 Brandon Guyer roster status changed by Durham Bulls. May 1, 2012 Durham Bulls placed RF Brandon Guyer on the 7-day disabled list retroactive to April 27, 2012. March 18, 2012 Tampa Bay Rays optioned RF Brandon Guyer to Durham Bulls. September 30, 2011 Brandon Guyer roster status changed by Tampa Bay Rays. September 1, 2011 Tampa Bay Rays recalled Brandon Guyer from Durham Bulls. September 1, 2011 Brandon Guyer roster status changed by Tampa Bay Rays. August 13, 2011 Brandon Guyer roster status changed by Durham Bulls. July 27, 2011 Durham Bulls placed RF Brandon Guyer on the 7-day disabled list. July 11, 2011 Tampa Bay Rays optioned RF Brandon Guyer to Durham Bulls. July 10, 2011 Tampa Bay Rays recalled Brandon Guyer from Durham Bulls. May 8, 2011 Tampa Bay Rays optioned Brandon Guyer to Durham Bulls. May 6, 2011 Tampa Bay Rays recalled Brandon Guyer from Durham Bulls. March 11, 2011 Tampa Bay Rays optioned Brandon Guyer to Durham Bulls. November 19, 2010 Chicago Cubs selected the contract of Brandon Guyer from Tennessee Smokies. October 4, 2010 Tigres de Aragua signed RF Brandon Guyer. May 29, 2010 Brandon Guyer roster status changed by Tennessee Smokies. May 15, 2010 Tennessee Smokies placed RF Brandon Guyer on the 7-day disabled list. May 10, 2010 Tennessee Smokies activated RF Brandon Guyer from the 7-day disabled list. April 29, 2010 Tennessee Smokies placed RF Brandon Guyer on the 7-day disabled list. March 12, 2010 RF Brandon Guyer assigned to Chicago Cubs. September 1, 2009 RF Brandon Guyer assigned to Tennessee Smokies from Daytona Cubs. June 13, 2009 Brandon Guyer assigned to Daytona Cubs from Tennessee Smokies.